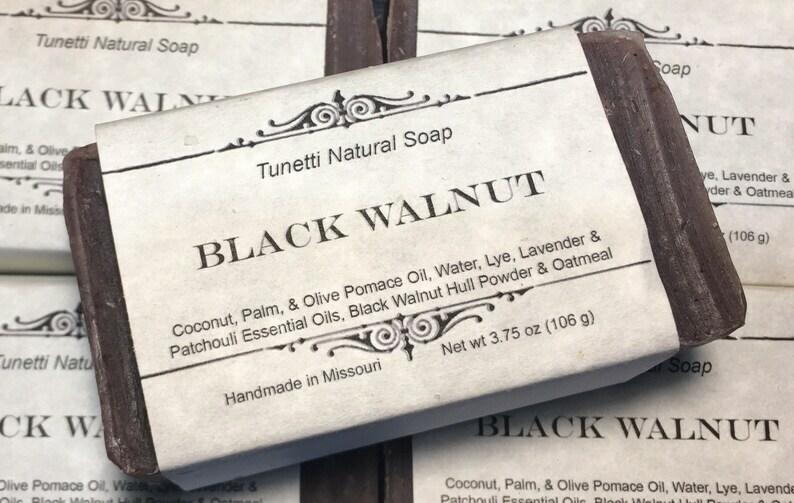 This soap is made only with all natural ingredients: Coconut Oil, Palm Oil, Olive Oil, Water, Lye, Black Walnut Hull Powder, Patchouli & Lavender Essential Oils, Oatmeal, And Vitamin E. The essential oil blend creates a nice earthy scent that's not overpowering. - Aromatherapy include anti-depressant properties, calming and enhancing the senses. - Antiseptic properties that heal various skin conditions including psoriasis, dermatitis, and eczema. - Anti-aging properties keeps skin looking young and healthy. Each bar weighs approximately 4 ounces. Each bar is cut by hand so sizes and weights may vary. Calmed my eczema in two uses! Love! !